If you notice stains, dark spots and blemishes on your sofas or armchairs, you can use our services to remove them and restore their cleanness. Our staff provide dry, steam, vacuum cleaning of upholstery and removing of stains and odours from it. They can deep clean or refresh your sofas and armchairs. 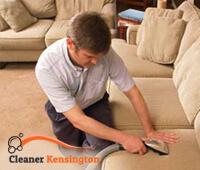 The upholstery cleaning which we provide can be used by the Kensington residents any day and time in the week. Our company works seven days in the week and provides professional cleaning of sofas, armchairs, car seats and all kinds of upholstered pieces of furniture. Use our services to restore the attractive and hygienic condition of your sofas, couches, car seats and any other upholstered items which you need cleaned. After hoovering and pre-spraying the upholstery, the cleaners will dry or steam clean it and use industrial driers to make it fast ready for use. When our cleaners deodorize the upholstered pieces of furniture, they will be spotless and impeccable. Use our services, available in Kensington to receive the upholstery cleaning which you need in your domestic or commercial property. The vacuum and steam cleaners which our employees use in their work extract all the dirt, dust mites, allergens and soiling from the fabric of the upholstery. They will make your furniture look like new for no more than a couple of hours. 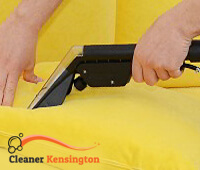 The upholstery cleaning which we provide in and near Kensington is low-cost and effective.